I’ve double and triple-checked the date – we’re well past the day for springtime jocularity, so that can’t be used to explain the emergence of a new, unannounced chip on top-end chip on Intel’s own site. Rather, it appears the semiconductor giant have jumped the gun a bit by mentioning the Core i7 6950x Extreme Edition, a formidable-sounding CPU, on their own site. Enjoying a high-end rig? Make the most of it with the best PC games of 2016 so far. 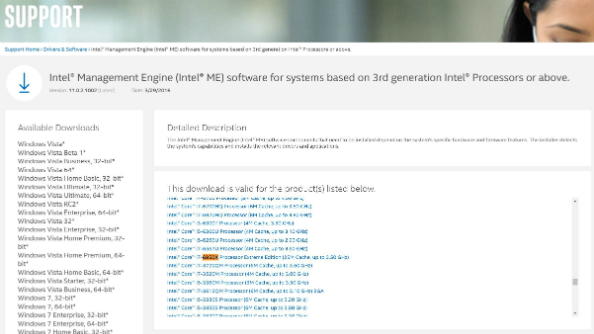 The unannounced model appears in a list of compatible chips during the Intel Management Engine (IME) download process. It sticks out like a sore thumb against the other CPUs in that list, with a stated 25MB cache and 3.5GHz operating frequency. That extraordinarily high amount of cache capacity, coupled with its name, has led some to speculate that the 6950x EE will feature as many as ten cores. Ten! If so, it’ll be the company’s first ten-tore CPU not intended for server use, but rather for consumers. And the logic does follow – current i7 6800 and 6900 models are built using the Broadwell-E architecture and feature six, eight, and ten-core variants, compatible with the X99 Express chipset. An Extreme Edition of the 6900 series, then, would be very likely to feature ten cores. TechPowerUp are speculating that it’ll cost in excess of $999, although there’s no information regarding pricing within Intel’s site where the chip briefly leaked. It’s also suggested that it’ll launch soon, at around Q2 2016 – with some literature regarding the chip already written up within Intel’s site, that seems like a reasonable estimate. However, Intel haven’t offered any official statement on the 6950x’s appearance, so it’s not time to take this as gospel quite yet. We’ll update as and when we hear more.